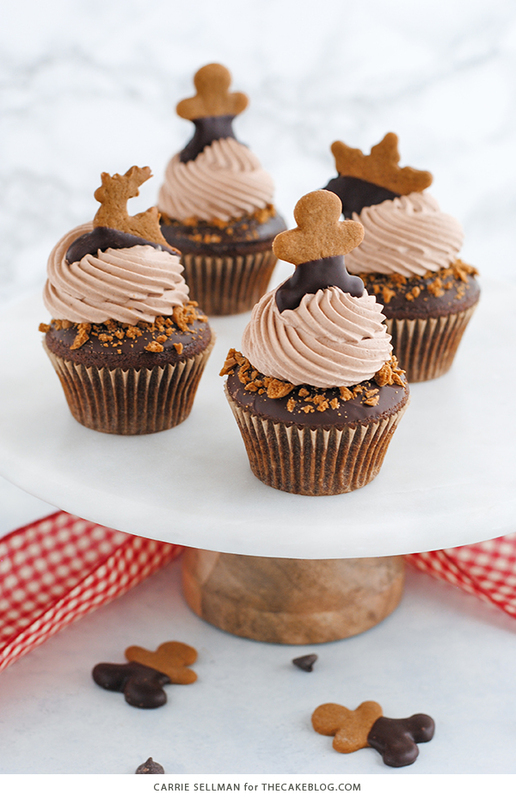 Chocolate Gingerbread Cupcakes – nostalgic gingerbread spiced cupcakes, topped with chocolate ganache, silky chocolate buttercream, gingerbread cookie crumbles and a chocolate dipped gingerbread cookie topper. 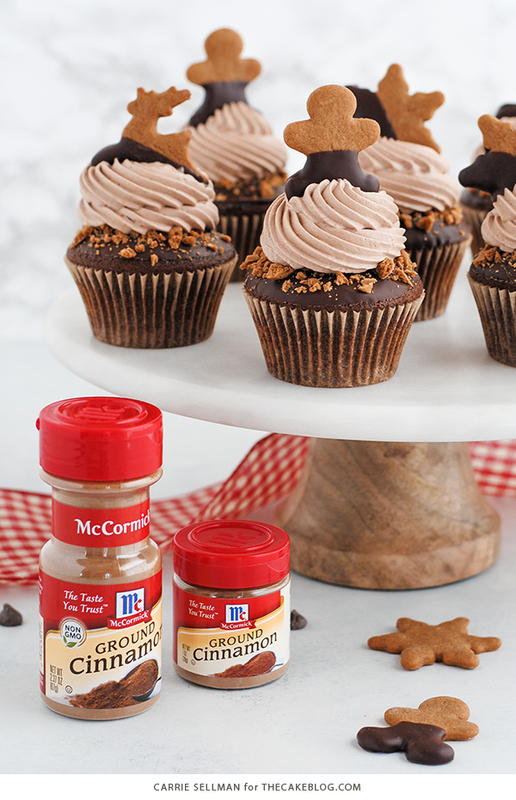 A new holiday cupcake recipe, sponsored by McCormick®. Christmas is less than two weeks away. I repeat, LESS THAN TWO WEEKS AWAY! I don’t mean to shout but can you hear the panic through my capital letters? How can it be mid-December already? Every November I tell myself THIS will the THE YEAR… the year that I get a head start on shopping and baking and wrapping and shipping and all things Christmas. And every year come mid-December, it’s the same story. My holiday prep list is still staring me in the face, with far too few items X’d off, and I resign myself to the thought that NEXT year will be my year to get it all together. It’s funny though, no matter how crazy December gets, the smell of baking Christmas cookies takes me back to a time when the holiday season was a lot simpler. Ah, to be a kid again! I have such fond memories of making Christmas cookies and candies with my mom and sisters. Our version of Christmas treats involved a lot of chocolate – as in everything was dipped in chocolate! We would dip pretzels, raisins, peanut butter balls, nuts, potato chips – yes, we were ahead of our time dipping potato chips back then – but if you could balance it on a fork and submerge it in chocolate, we probably tried it! Now with my own daughter, our Christmas traditions look a little different. We started decorating gingerbread houses four years ago and it has become a cherished activity in our house. She watches patiently as I work on projects for the blog all year long. But the gingerbread houses are a different story. She is in charge of the decorating and the possibilities are endless! And there’s just something about the aroma of gingerbread that puts me in the holiday mood. As a mom, it’s so rewarding to watch her creativity flow, knowing that we’re making a whole new generation of family memories. For today’s recipe, I decided to merge my nostalgic memories of chocolate dipping with our new tradition of gingerbread. And cake of course. 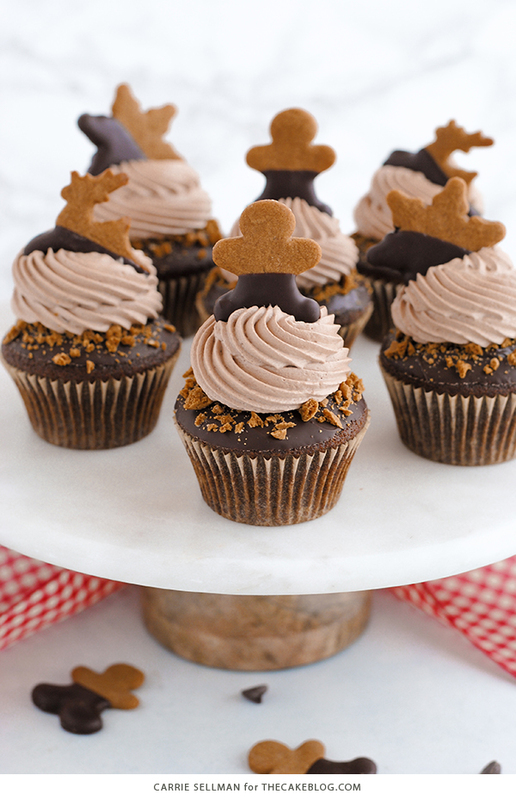 The result are these Chocolate Gingerbread Cupcakes! 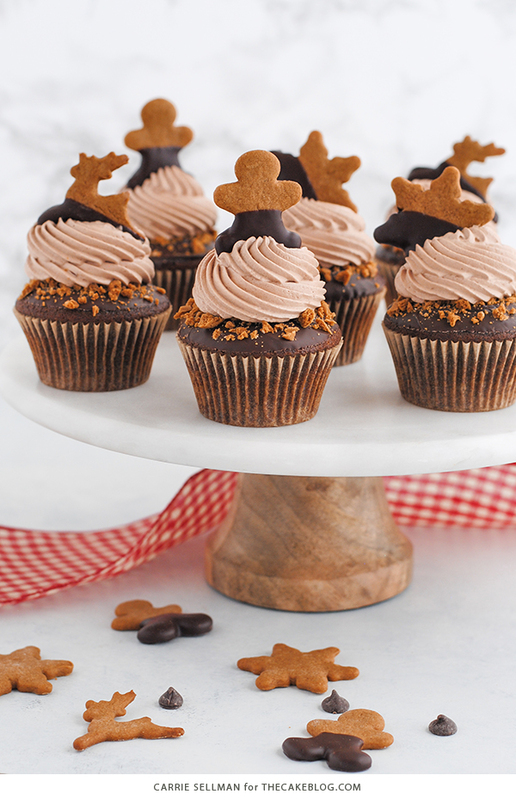 It all starts with a fluffy cupcake that embodies all of the traditional spices of gingerbread paired with the smoky goodness of molasses and dark brown sugar. Then we dip the cupcake into a smooth chocolate ganache, creating a thin layer of chocolate perfectly sticky and ready to recieve a light sprinkling of chopped gingerbread cookies. 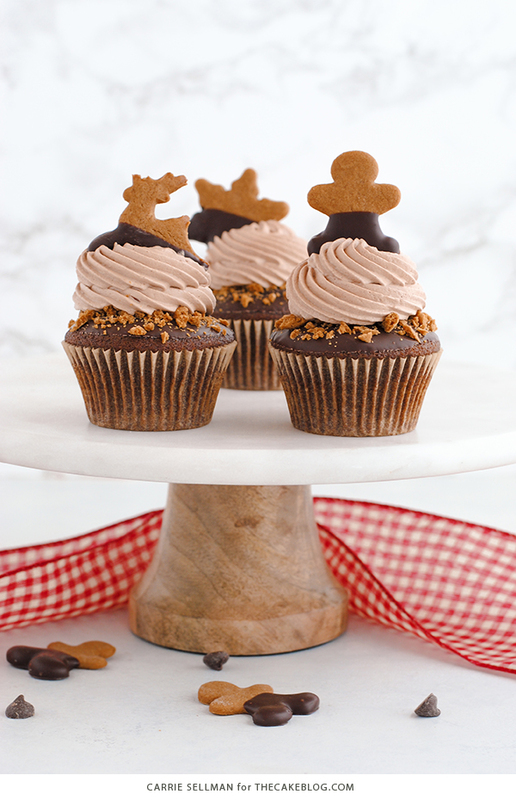 A swirl of silky chocolate buttercream and a chocolate dipped gingerbread cookie top it all off. I used McCormick Ground Spices because that’s what we always use! Hello quality spices available at my local grocery store. You’ve been making holiday desserts amazing for as long as I can remember and your classic red cap is conveniently easy to spot. Into my grocery cart you go! You will soon fill my kitchen with a glorious aroma and the feeling of Christmas. 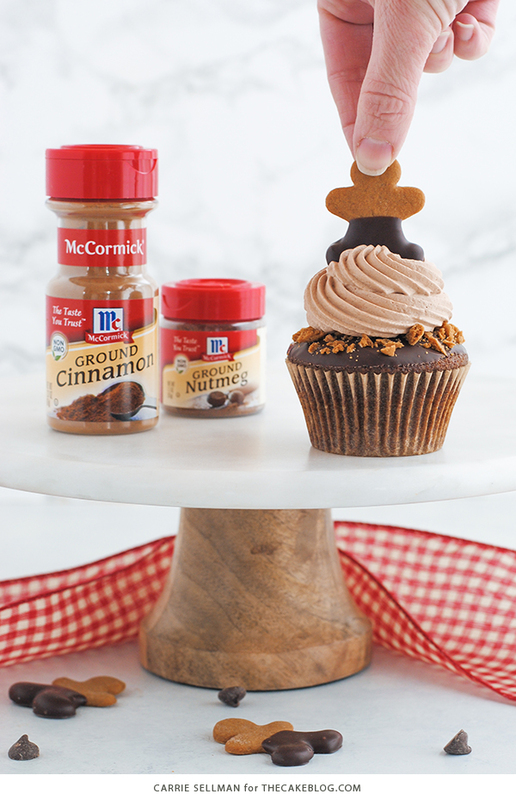 Since this cupcake has more than enough steps and your holiday to-do list is sure to be as long as mine, take the liberty of using store bought gingerbread cookies. This is one shortcut that no one will notice and you’ll be plenty pleased with the results. Give them a quick dip in melted chocolate and let them dry on parchment paper to make them your own. Or just leave them plain, it’s up to you. No matter what your next two weeks looks like, I hope you’re able to spend some time in the kitchen, reliving favorite family memories and making new ones to cherish. Preheat the oven to 350°F. Line cupcake pan with cupcake liners. In a medium bowl, whisk together flour, baking soda, McCormick Ground Cinnamon, McCormick Ground Ginger, McCormick Ground Cloves, McCormick Ground Nutmeg, and salt. Set aside. In a large bowl, whisk together the melted butter, brown sugar, molasses, and eggs. Add half of the water to the melted butter mixture, then half the dry mixture, and stir. Add the remaining water and dry mixture, whisking until smooth. Divide the batter between the cupcakes liners. Bake for 20 to 22 minutes, until a toothpick inserted in the center comes out clean. Remove the cupcakes from the oven, and transfer them to a rack to cool for 30 minutes. Add McCormick Pure Vanilla Extract, chocolate and whip on medium-high until silky and smooth, about 3 to 5 minutes. The buttercream may look like it’s curdled at some point. Keep mixing until it is completely smooth. Dip tops of cupcakes into chocolate ganache, letting excess drip off before turning upright (alternatively, spread a light coating of chocolate ganache onto cupcake using an offset spatula if you find that easier). 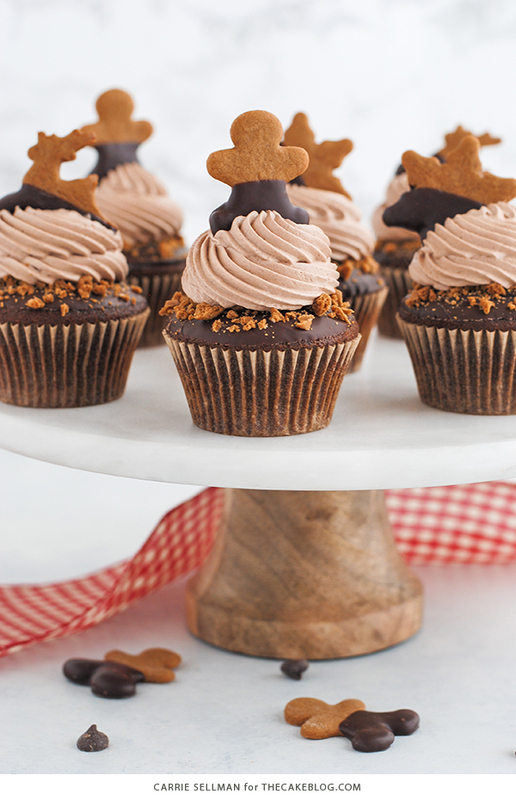 Sprinkle tops with chopped gingerbread cookie crumbs. Using a pastry bag fitted with a #867 tip, pipe a swirl of buttercream frosting. Top with a gingerbread cookie, if using. Best enjoyed at room temperature. Store leftovers in the refrigerator. This is a sponsored post written by me on behalf of McCormick. These are so cute and I can’t wait to try them. Can you please share where you bought the small gingerbread cookies? I’ve been looking all over and can’t find anything like them. Hi Ginny! I actually made these gingerbread cookies, using this gingerbread cookie recipe and these mini cutters. But Williams-Sonoma sells a red tin of Moravian Ginger Spice Cookies (tree, snowman, stocking, etc) that would work for you. We also love the tin of ginger snap cookies by Nyåkers (circles or hearts) that you can generally find at World Market. And Pepperidge Farms makes a gingerbread man shaped cookie that you might be able to snag at the grocery store. Hope that helps you track some down. Enjoy! I made those cupcakes yesterday and I enjoyed the process so much! I bought the cookie cutters online one week ago and didn’t have any idea how to use them, so it was perfect that I found your recipe. I replaced the sugar with brown rice syrup and all the family loved it! Hii, recipe looks great but what can i use as a substitute to molasses? You could substitute brown sugar for the molasses. That being said, the flavor and color will be off a tad without the molasses. Hello. Do you think substituting the semi sweet chocolate with dark chocolate (about 50% ish cacao) would work? My 15 year old daughter loves to bake and she’s just made these. We made them without the cookies, but oh my goodness, they are good. The frosting tastes kind of like hot chocolate. It’s such a nice balance of flavors! Thank you so much. Can’t wait to try more if your recipes!